What’s Behind Cambodia’s War on Fake News? The government’s efforts to regulate fake news have raised concerns amid a wider campaign to suppress dissent as elections approach. Salt producers in the Kingdom will meet next week to finalise import quotas in line with domestic demand, the chief technical officer of the Kep-Kampot Salt Producers community (KKSPC) said on Sunday. Another Cambodian casino has been shut down for staging cockfights, and some local residents are pissed that the operators have apparently received only a slap on the beak. Vietnam and Cambodia have agreed to enhance their economic cooperation and intend to raise bilateral trade to $5 billion in the coming years, writes Vu Quang Minh. National Bank of Cambodia (NBC) and the Bank of Korea (BOK) on Friday signed a joint-research agreement geared towards the close collaboration between researchers in support of the development of the economic and financial system in Cambodia. 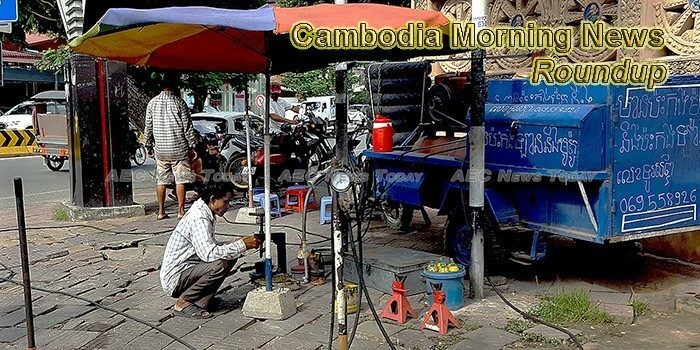 The Securities and Exchange Commission of Cambodia (SECC) approved an application last week to list power infrastructure provider Pestech Cambodia. This will pave the way for the firm to begin its initial public offering (IPO). After backing a loan in May to a Cambodian firm for the first time, the Export-Import Bank of the United States (EXIM) said it is looking forward to continue facilitating purchases of equipment and business deals between US and Cambodian companies. Two of Cambodia’s start-up airlines, JC International and Lanmei Airlines, are increasing international services this month. Three political parties yesterday criticised the ruling CPP for its failure to implement lawseffectively while appealing to voters to support their parties at an election roundtable organised by Khmer Times. Expand A man holds a portrait of Kem Ley, an anti-government figure and the head of a grassroots advocacy group, “Khmer for Khmer”, shot dead on July 10, as they attend a funeral procession to carry his body to his hometown, in Phnom Penh July 24, 2016. His Majesty King Norodom Sihamoni, on Monday, chaired the “National Arbor Day” in Kampot’s Tuek Chhu district, with the participation of Senate president Say Chhum, National Assembly president Heng Samrin, Minister of Royal Palace Kong Sam Ol, Minister of Interior Sar Kheng, and other members of the government, foreign ambassadors to Cambodia, and 5,000 local people. Phnom Penh immigration police force of the General Department of Immigration and anti-drug department, on 6 July, arrested three more suspects and confiscated 26 kg of methamphetamine and ketamine. Phnom Penh Municipal Court yesterday jailed a South African man to life in prison for trafficking nearly one kilo of cocaine which was recovered from his stomach.